Two years back, had we suggested that you invest in international funds, you might have jumped at the opportunity. And why not? The year 2007 saw the launch of 12 international funds, eight of which were launched between August and October, when global markets, including India, were touching new highs. In 2007, the Securities and Exchange Board of India (Sebi) raised the overall ceiling for investments in foreign securities by mutual funds to $5 billion (around Rs23,000 crore now). It did not take long before the fundamental reasons for launching international funds were tossed out of the window. In 2008, markets collapsed in the US on the back of the credit crisis, and Indian markets followed suit. If you had invested in international funds to protect your portfolio from the vagaries of just one market (India), your strategy would not have paid off—almost all the markets tumbled in 2008. So, does investing in international funds still make sense? Read on. International funds are funds that invest in international markets. Broadly, there are two types. One, that invests in both Indian and foreign markets, such as Fidelity International Opportunities Fund and ICICI Prudential Indo Asia Equity Fund. This lot typically invests at least 65% in Indian securities and the rest in international equities, as income-tax rules mandate investments of at least 65% in Indian securities to retain the equity tax advantage. Some funds invest in only one country apart from India, such as Fortis China India Fund and Mirae Asset China Advantage Fund. The second category is of purely international funds that invest their entire corpus internationally, such as Birla Sun Life International Equity Fund and HSBC Emerging Markets Fund. They can invest either in international schemes run by their foreign parents, which would further invest in international markets, or they can directly buy and sell international stocks. Currency risks: While the fund’s success rests on the quality of fund management, much like any domestic mutual fund scheme, the biggest risk for international funds is currency risk. The movement of the rupee versus the US dollar—the currency most international funds solicit investments in—affects the performance of your fund. For example, let’s suppose you invest Rs10,000 in an international fund in India. Assume that your fund invests in US dollars and the exchange rate at the time of investment is Rs50 to a dollar. You will get equities worth $200. Suppose that after a year, the rupee depreciates by Rs2 and stands at Rs52 to a dollar. If your fund redeems its money, assuming that foreign equities have not risen or fallen at all, your $200 would now be worth Rs10,400 (a 4% gain), purely on exchange rate play. Obviously, the exchange rate can also turn against you if the rupee appreciates. The real currency risk comes when the rupee appreciates against the US dollar much more than other global currencies. If this happens, your international funds incur a loss. The trick for fund managers would be to anticipate not just the rupee-dollar equation, but also the equations of the US dollar with other currencies, especially the Asian ones, since a majority of international funds aim to invest in emerging markets. Says Nilesh Shah, deputy managing director, ICICI Prudential Mutual Fund, “Investing in international funds helps to diversify the portfolio but investors should not forget to see the fund manager’s competency and his expertise in managing international funds." Country risk: Investing in just one foreign country is akin to investing in a sectoral fund that invests in just one sector rather than diversified equity funds that invest across sectors. There are several micro- and macro-economic and geopolitical factors that affect a country’s economic performance. Investing in international funds could be rewarding when certain countries are doing better than Indian markets, and if your fund is invested in any of them. They offer another way to diversity your investment portfolio and a chance to own phenomenal stocks such as Microsoft, Google, Siemens and the like with a tidy sum. On the face of it, international funds offer diversification. But is there enough merit in diversifying across countries? We ran two sets of numbers. If you look at the year-on-year returns of major stock market indices across the globe, international funds make sense. For instance, in the sample of emerging and developed economies we have considered, Mexico topped the charts in 2004 and Brazil scored in 2005. Look at China’s returns—while the Shanghai stock market outperformed the lot in 2006 and 2007, it was the worst performer in 2004, 2005 and 2008. But those were annual returns. Typically, though, you invest in equity funds with a long-term horizon. So, had you invested in the Indian markets as against any of the international markets five years back, and held on to your investments, you would not have regretted your move. Between 1 January 2004 and September 2009, the Sensex returned 19.71%. Had you invested in Japan or, say, the Dow Jones of the US, you would have lost your money. Says Surajit Misra, national head, mutual fund, Bajaj Capital: “There should not be more than 15-20% of international fund exposure in your portfolio, and it should be more focused on Asian markets. Also, the time horizon should be longer than for domestic funds, as only then it will serve the purpose of diversification." Though the fall in 2008 was drastic globally, the recovery in some emerging markets, such as India, has been dramatic. 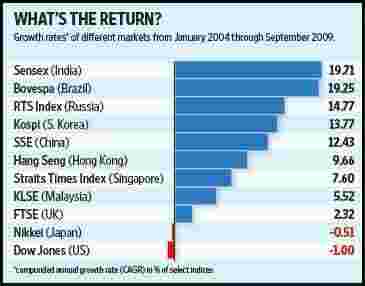 So far, in 2009, the Sensex has returned 68%, followed by China (54%). Market experts say the main reason for India’s fast recovery is strong internal consumption and domestic demand, against China’s reliance on exports. The US and many other countries in Europe, however, are still reeling under unemployment. This also affects consumption. Although the Indian economy received a big jolt in 2008, its resilience to the downturn compared with many global economies is well documented. Experts still believe India is a favourite destination for foreign inflows on reasonable valuations and sound fundamentals. While conventional investment wisdom calls for diversification, investing in international funds goes beyond the principles of diversification. Once you pass the first level of diversification (investments within India) across sectors and scrips, either directly or through the mutual fund route, you come across a whole set of complicated factors, which may or may not necessitate global diversification. As a thumb rule, avoid country-specific funds as their fortunes depend on the movement of a single country. If you must go for international funds, go for those that invest their entire corpus internationally. Avoid international funds if you are bullish on the long-term India growth story and believe there is enough money to be made in the country. As Pune-based financial planner Veer Sardesai says, “Investing in international funds is more like owning an international brand car, when even an Indian car can serve the purpose." Business loan customers have reason to smile. In a bid to check defaults, Barclays Global Retail and Commercial Banking (GRCB) India has introduced a reducing rate of interest for customers who pay their instalments regularly over a period of 12 months. The interest rate would reduce by 1 percentage point after every 12 months of regular payment for the entire loan term. This new concept, called the Drop Down Feature, is one of its kind and has been launched in view of the rising number of defaults in a weak economy. The difference between floating rate education loans and fixed rate ones is less than 1% per annum. So, unless you are sure about paying off the loan very quickly after finishing your course, it might be advantageous for you to plump for the relative safety of the fixed interest rate, especially since interest rates are widely expected to have bottomed out and are likely to rise over the next few quarters. In any case, this is not a one-time decision. You need to review it continuously based on changes in the marketplace, and switch if required. Ordinarily, a loan against property can be obtained against any property that you own. Therefore, you can obtain a loan against property even if you stay in a cooperative society. However, there are some differences in getting a loan against a house that is part of a cooperative society, any other apartment or independent house. In the case of a cooperative society, you will need to inform the bank that placing the house as collateral for the loan has the approval of the housing society. If you are looking for vehicle insurance, look out for the co-payment clause. Also known as “excess" in the policy, it makes you bear a portion of the claim. A higher excess would mean a lower premium since you shift some of the risk from the insurer on to yourself. So, if you agreed on a voluntary deductible of Rs2,500 and there is a claim for Rs7,500, the insurer will pay Rs5,000. Though you cannot take a deductible of more than Rs15,000, the option still makes sense. But if you can’t afford to pay a higher portion of the claim, then don’t bump up your excess.